When people struggle with mental illnesses, looking for a hand to hold or a shoulder to rest on during difficult times is sometimes necessary. Mental illnesses can come in many different forms, including depression, bipolar disorder, anxiety, post-traumatic stress disorder and more. 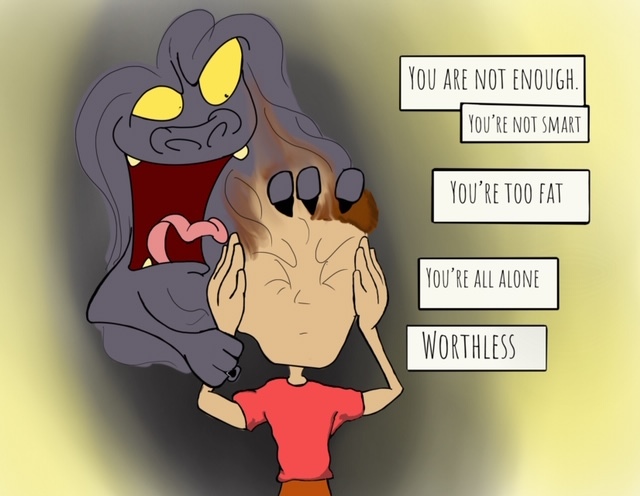 These mental illnesses can cause dreary thoughts and bring minds to worst-case scenarios, remembering painful times or worrying in a 24/7 loop, causing people to lose sleep, healthy thought patterns and peace of mind. When friends suffer from a mental illness, a relationship with them can change from one of fun to a time of caring for them through the friendship. As those battling mental illness can attest, being a compassionate friend is what they need during this time. It can be easy for those who have never been affected by a mental illness to not understand, oversimplify or excuse mental illness as if it were something a person chooses or just a bad day. Mental illnesses are the same as other sicknesses — an unchosen aberration in the body — and they should be treated as such. Lance Bordon, freshman entrepreneurship major, said mental illnesses have been addressed poorly in the past. Bordon said mental illnesses including depression or anxiety should be addressed with as much concern as any other illness such as dementia, which has influenced his family. Bordon said he saw how loved ones continued to stay strong for one another. Having a strong and healthy support system can make mental health problems easier to navigate. Aiding those with mental illnesses can start with those three steps: be joyful, be assuring and keep a positive mood. However, caring for those with mental illnesses sometimes requires more than just being an optimistic light in their life. Lauren Elkins, junior film studies major, said she has cared for her friends in multiple aspects to support them through mental illnesses. “I’ve had two friends, one who suffered from bipolar disorder and another with extreme ADHD (attention-deficit/hyperactivity disorder),” Elkins said. “I was no longer just their friend, but instead, I was everything keeping them afloat or sometimes even their enemy. Being actively aware of friends with mental illnesses can mean caring for them in many different ways, including making sure they are eating, sleeping and not hurting themselves. Strive to be a support system to them even when it can become exhausting. Dr. Natalie Rios, assistant director of the California Baptist University Counseling Center, said friends have a major role in helping those with mental illnesses and are often some of the only pathways to recovery. “Friends can play a very positive role in the lives of people struggling with mental illness,” Rios said. “They can be an important support system so the person does not feel alone in these struggles. Struggling with a mental illness can be a paralyzing thing. Sometimes the only reason people suffering choose to keep fighting are those reminders from friends and loved ones that they are remembered, valued and appreciated by them.